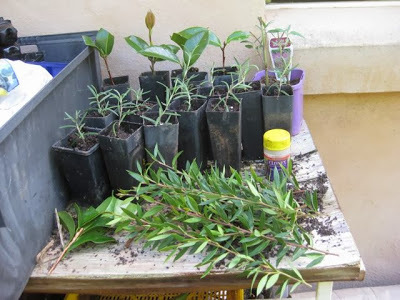 Making New Plants from Old – It’s Fun, Free and Easy. 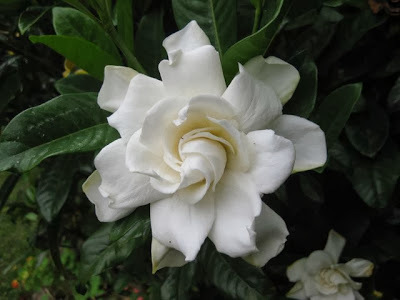 The beautiful Gardenia magnifica – flowering in all its glory in my garden right now and struck from a bunch of flowers I received about ten years ago. I have propagated about 5 of these bushes for my garden, and have made many more for friends and family – all from one bunch of flowers! I seem to have morphed into my parents! They have had a plant stall outside their place for years selling produce from their garden, and now I have one outside mine, mainly selling plants that have all been propagated from things in my garden. I have come to realize that, actually, some of my favourite times in the garden are the hours I spend propagating – I find it very creative and deeply satisfying. FACT: First of all, a word about SEEDS v CUTTINGS. SEEDS are the children of the plant and, like children, they will all be similar to the parents, but different – some more different than others. 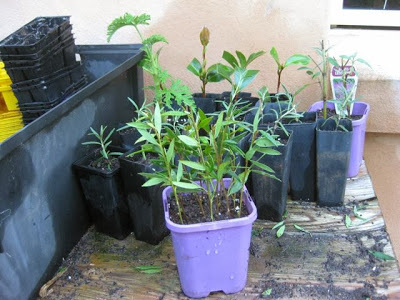 With CUTTINGS you are getting an exact copy of the parent plant – like a clone. This is useful if you want the plant to look exactly the same as the parent plant OR if seeds are hard to come by – as with plants like camellias, gardenias and many other ornamental shrubs. STEP 1: Select the plant that you want to take cuttings from. Do this on the day that you are going to strike them as cuttings will always take better if they’re really nice and fresh and from the healthiest, best material off the parent plant. I usually do this in the morning before the day gets too hot. 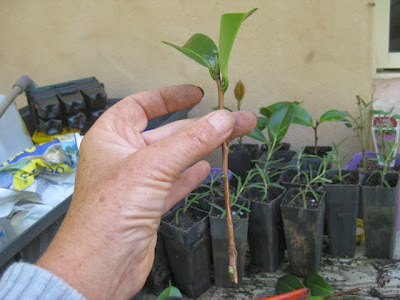 Camellia cutting prepared for planting – note the cut-off at the bottom just below the node. 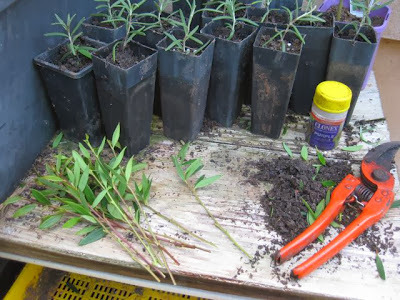 Small-leaved grevillea cuttings. This is a soft-wood cutting. Propagating medium. You want a fine free-draining mix that will fit snuggly around the cuttings. I use sieved soil, compost and some perlite/vermiculite. A really good, sharp pair of secateurs. Propagating hormone. Either hormone powder or the liquid or gel version, which is particularly good if the cutting is from a plant that bleeds sap as it seals the whole cut. You can even use honey. All these products help stimulate callous tissue that will then encourage the cutting to produce roots. A dibbler. This can be a pencil or a chopstick. 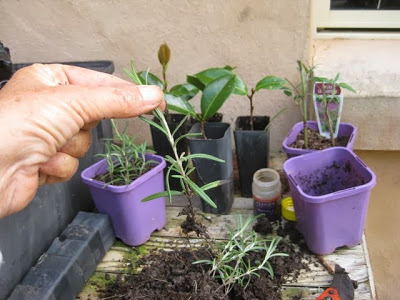 Make your cuttings about 15cm long, look for a node where the bud or a leaf scar was and make a clean cut just below it. A node is the spot that has the greatest concentration of growing cells – i.e. able to produce roots. Remove about two-thirds of the lower leaves by simply running your fingers down the stem. Pinch out any sappy, green growth at the top of the cutting and remove any flowers, fruit or seeds. You will end up with a cutting about 10cm long. 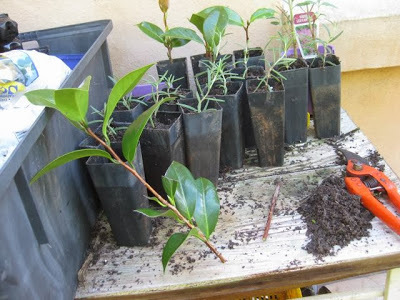 NOTE: When you are propagating from cuttings you want the plant, initially, to put all its energy into making roots – not leaves, flowers or fruit. That’s the reason why most of the leaves are removed. TOP TIP: If the leaves on a plant are really large – cut the leaves in half as it allows you to put more than one cutting in a pot. It also reduces transpiration of the cutting allowing it to put all its energy into producing roots. 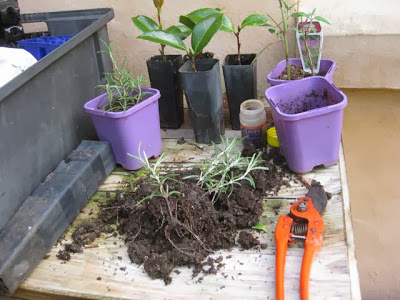 Rosemary cuttings that have already taken root and are now ready to be potted up or planted directly into the garden. The next step is to get the dibber and make a hole for the cutting in the propagating mix. You should never just push a cutting into the propagating mix as you may damage the cambium tissue, as well as push away any of the hormone product you have on the cutting. Once all the cuttings are in place, water them in well. In the coming weeks, make sure the pot is kept moist. This can sometimes be aided with either placing a plastic bag or drink bottle over the top of the cutting, creating a mini greenhouse. To work out if the cuttings have struck or grown roots, look at the bottom of the pot for root growth coming out of the drainage holes. If so, it’s then time to plant them up into individual pots or even straight into the garden.